Image and results from Ocala courtesy of @FLWrestlingFan. Estimated attendance: 300 people. Jose hit his pop-up punch to win. - Buddy Murphy cut a promo in the ring and issued an open challenge for later in the night. 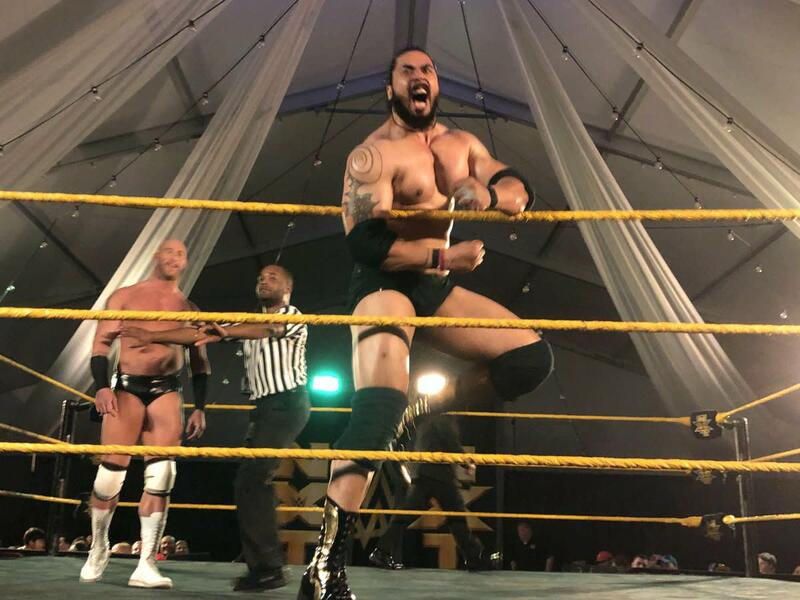 - There was an in-ring segment where Wesley Blake and Steve Cutler went back and forth with Dory Funk Jr. (who makes appearances when NXT comes to Ocala) before Babatunde Aiyegbusi showed up to fight. Chad Lail caused the disqualification. Blake, Cutler, and Lail ganged up on Aiyegbusi until Funk ran them off with a whip. Shera was making his NXT debut here after WWE announced last month that he had reported to the Performance Center. He won with a roll-up. This was said to be a great match. Strong won by submission with the Strong Hold. Moon finished the match with The Eclipse. This was said to be an excellent match as well. It was the first time Ricochet has wrestled at a Florida NXT show, though he was on the road tour last week in matches against Murphy. A match between them definitely has to be on television soon. This was a good match despite the crowd not being as familiar with Jaoude and Bononi. Montez Ford took most of the punishment until Angelo Dawkins got the hot tag. The Street Profits won after Ford hit a frog splash off the top rope. Evans controlled almost the whole match. Kai took a bad bump between the ropes and straight to the floor at one point but was okay. Kai made a comeback near the end, landed a running kick in the corner, used another kick, and hit a double stomp off the top to win. While she was celebrating, Shayna Baszler came out through the crowd and attacked her and choked her out. Surprisingly, this was a competitive match. Dijak was able to get some offense, but Sullivan beat him by using the Freak Accident. After that, Sullivan went to leave but came back to hit the Freak Accident again. This was a really good match with some funny moments. The crowd was behind Ohno since he's from Ohio. Cole also got a huge pop. Heavy Machinery used bear hugs for the first part of the match, then Undisputed Era trapped Tucker Knight in their corner and worked on his knee and leg. Heavy Machinery went to pancake Fish and O'Reilly outside of the ring, but they moved out of the way. That distracted Ohno, allowing Cole to pin him with a roll-up. Baszler worked over Sane's arm for the whole match. She had it won but pulled Sane up before the three count. She was going to give Sane more punishment, but Dakota Kai came out and kicked Baszler in the back and caused the disqualification. Kai kept kicking Baszler and did her running kicks, then Sane came off the top rope with the Insane Elbow. Baszler was the only person who drew real heat from the crowd. This was probably the best match on the show. Dream was over huge with the crowd, getting "Say my name" and "Velveteen" chants. They did lots of back and forth and it was similar to their TakeOver match. There was lots of action, with Black coming out of it victorious. Almas and Gargano started, with Almas mostly in control but Gargano getting some offense. Gargano was finally able to go for the tag, but Vega ran around and pulled LeRae off the apron. Almas then continued beating down Gargano. Finally, Gargano was able to tag in LeRae and she put a beatdown on Vega. The biggest spot in the match was Almas going for his double knees in the corner but LeRae jumping in front and stopping him. She then started hitting Almas with some big forearms. The finish of the match was cool. Both Gargano and LeRae hit superkicks, did the head scissors into the Gargano Escape, and Vega tapped out.